A deck gazebo can enhance the utility and beauty of your existing outdoor space. Made from a wide variety of materials ranging from canvas to wood, there is a deck gazebo for almost any budget or set of circumstances. There are a wide variety of gazebos available for homeowners. 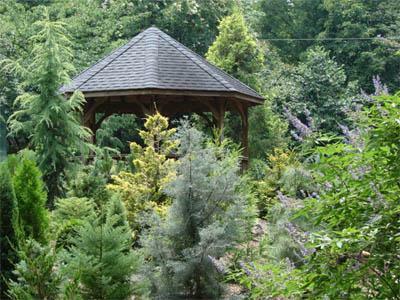 While their appearances and prices vary greatly, every gazebo falls into one of two categories. A semi-permanent gazebo sits on top of an existing deck and is not tied into the existing structure. The most common semi-permanent gazebos are made of canvas with a metal frame. They are best for homeowners who plan on using their gazebo for only a small portion of the year. Semi-permanent gazebos are inexpensive, but will not last as long as other gazebo types. There is some risk of the gazebo being damaged by winds or even blowing away if not properly secured. However, semi-permanent gazebos can also be moved according to the whims of the homeowner and the seasons. Permanent deck gazebos are an integral part of the deck design. Usually made of wood, they are constructed to blend seamlessly with the rest of the structure. For this reason, their appearance can vary widely, ranging from the highly ornate to a more modern look. Permanent gazebos may require an architect or other building professional to construct. You will have to obtain building permits and follow all applicable codes. They are also more expensive than semi-permanent gazebos. However, once a permanent gazebo is built it will appreciate and add value to your home. The largest concern when adding a gazebo to an existing deck is the underlying structure. It is very important to have your deck evaluated for structural stability before adding any type of gazebo. Decks that are found to be structurally insufficient can be reinforced so a gazebo can be accommodated. If you find that you must alter the existing deck significantly to add a gazebo, you may want to build the gazebo as an extension of your deck. This will allow you to build the gazebo to accommodate building codes and structural restrictions without significantly altering the existing deck. Keep in mind that your gazebo should match the rest of the deck in both material and style. In general, try to match the level of detail present on the deck railing. This will help integrate the gazebo with the surrounding structure. While structural considerations are particularly important when building a permanent gazebo, safety should not be ignored when using a semi-permanent gazebo. Small structural flaws may become exacerbated by the extra weight of the gazebo. For this reason it is essential to have a professional evaluate your deck before adding the gazebo. Permanent gazebos should be treated with stain or paint to protect them from rot. If you know how to stain a deck you can often do this work yourself. Keep in mind that a gazebo can be more difficult to stain or paint if it is particularly ornate. You should check your gazebo each year for worn finishes. Plan on repainting or sealing your gazebo every three to five years to preserve and protect the wood underneath. If you aren't interested in regular maintenance, consider a gazebo made of metal or composite materials. Both of these materials will significantly reduce any required maintenance. It is also important that your entire deck is checked annually for any possible structural problems. Rotten boards, loose fasteners and split joists should all be dealt with promptly before the gazebo receives any use. Once you have chosen and built your gazebo, consider adding a few extra elements to get the best use out of your space. Bench seating, outdoor lighting and a few cushions can help you create a haven in your deck gazebo made for enjoying the summer months.